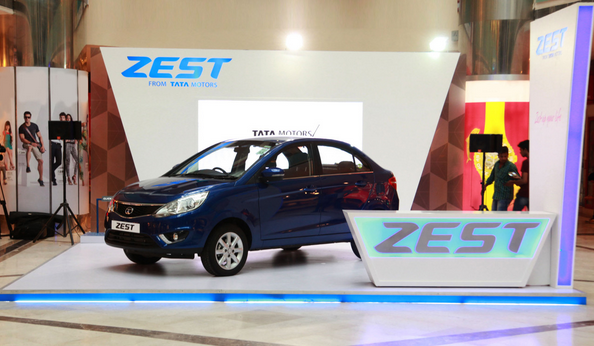 Tata Motors today launched the much awaited Zest compact sedan in India. The Zest compact sedan is priced at Rs. 4.64 lakh for base petrol and Rs. 5.64 lakh for the base diesel variant (All prices Ex-showroom, New Delhi). Tata Zest is the compact sedan version of Manza with lots of changes to the sheet metal to engine to driving dynamics. Tata Motors has worked hard to make the vehicle a pure driver’s car, the essence which was lacking in all Tata vehicles. Of course the Zest wins over all its competitor in terms of space and seating comfort, a feature seen in Tata cars. To remind our readers, Tata Motors was the first to launch a compact sedan in India in the form of Indigo CS. Tata Zest compact sedan is available in 4 trims on petrol and 5 trims on diesel. The petrol variant is powered by all new 1.2L Revotron engine developed in house by Tata Motors. It has power output of 88 Bhp and 14.27 kgm of torque and comes with three driving modes – Eco, City and Sport. The diesel variant gets the same Fiat sourced 1.3L Multijet diesel with two power outputs – 74 Bhp and 89 Bhp. Both the petrol and diesel variants are mated to a 5 speed manual transmission and top of the line diesel model gets an automated manual transmission (AMT) as well. The Zest compact sedan gets a dual tone dashboard and plenty of equipment seen first on any Tata car. Top end model gets day time running lights as well. With the car, Tata Motors has introduced a new warranty scheme of 3 years or 1,00,000 Km with an annual maintenance contract of 3 years or 45,000 km and a free 24X7 roadside assistance service for 3 years.